This lecture is dedicated to the comprehensive discussion of Fat Soluble Vitamins. In section one of this lecture, the educator highlights Classification and Characteristics of Fat Soluble Vitamins. Firstly, a description of Vitamins is put forth after which an elaborate overview of Classification is presented. Subsequently, light is shed on the Benefits of Vitamins and their Characteristics. The educator then progresses towards the demonstration of Fat Soluble Vitamins. Apart from this, the concept of Vitamers is clarified. Section two is about Vitamin A. In this section, the Chemistry of Vitamin A is discussed followed by an elucidation of Sources of Vitamin A. The educator then focuses on the Daily Requirement of Vitamin A and elucidates different Forms of Vitamin A. Subsequently, the Functions of Vitamin A are brought under consideration. These functions include Vitamin A’s Role in Vision, Role in Reproduction, Role in Epithelialisation, Role in Bone and Teeth Formation plus Role in Growth and Metabolism. In addition to this, information is given regarding the Absorption, Storage and Transport of Vitamin A. At the end of this section, the case of Hypervitaminosis A is highlighted. In section three, the topic of Vitamin D is discussed in detail. 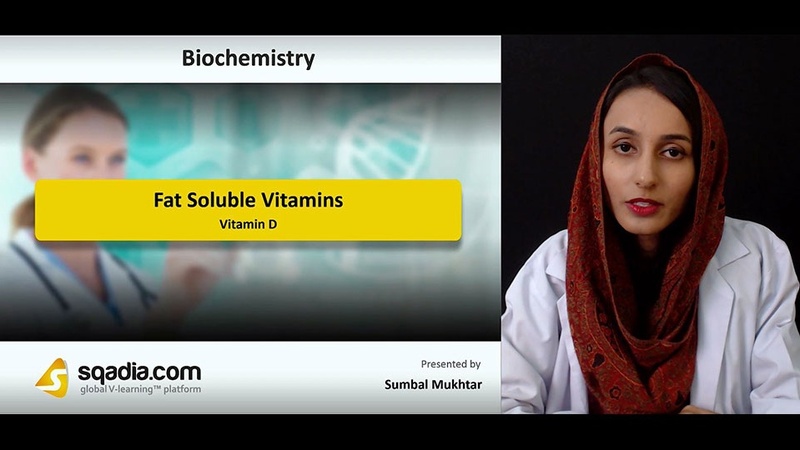 The educator explains Chemistry of Vitamin D at first. Later, the different Vitamin D-Sources are highlighted in addition to its Daily Requirement. Moreover, the educator focuses on Absorption and Transport of Vitamin D and sheds light on the process of its Synthesis. Moving forward, the Biologically Active Form of Vitamin D is thoroughly reported. Apart from this, the educator speaks extensively about Functions of Vitamin D which include Intestinal Absorption of Calcium and Phosphate, Mineralization of Bones, and numerous Other Functions. Information is also given about Deficiency of Vitamin D and the case of Hypervitaminosis D is discussed towards the end of this section. The prime focus of section four is Vitamin E. The educator puts forward a detailed explanation of Chemistry of Vitamin E and talks about numerous sources of Vitamin E (Tocopherols). Apart from this, a comprehensive overview of Functions of Vitamin E is presented. The Antioxidant Property of Vitamin E is brought under consideration after which its Role in Reproduction in Rats is discussed. Following this, light is shed on Other Functions of Vitamin E. Afterwards, the educator addresses Therapeutic Uses of Vitamin E and deals with the elucidation of Deficiency of Vitamin E.
Section five accommodates the discussion of Vitamin K. First of all, the Chemistry of Vitamin K is described. Afterwards, the Types of Vitamin K are extensively reported. Moving forward, the educator demonstrates different Functions of Vitamin K. Moreover, the Functions of Vitamin K are pursued in detail such as its role in Blood Coagulation, Calcium Binding Proteins, and Oxidative Phosphorylation. The educator concludes this section by shedding light on Deficiency of Vitamin K.